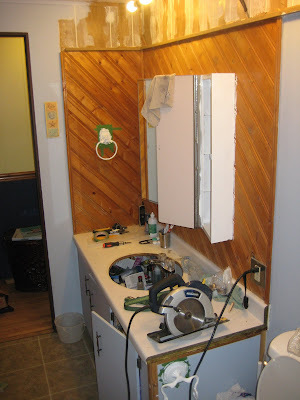 diary of a crazy person: Bathroom Renos! 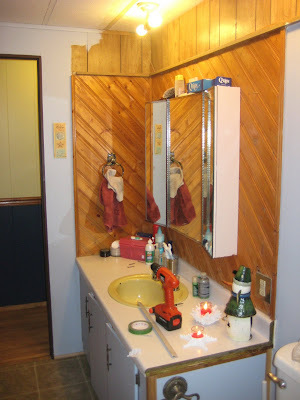 We decided to give the our little bathroom a bit of a facelift! It is not finished yet, bit I have the before and during pics right now! I am excited about getting it done! We are doing it cheap. We painted the tub instead of replaceing it. It's $20 compared to $300+! The downside is that it looks painted, BUT anything is better than BILE yellow. And it looks ALOT cleaning. 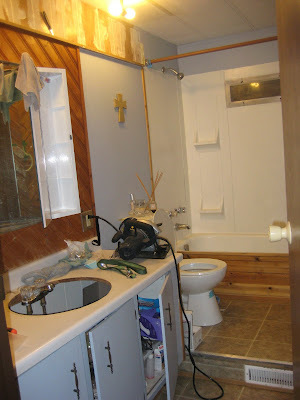 We also replaced all of the shower plumbing, which is AWESOME! Now I can actually have a hot shower instead of a hot to warm then burning then warm then cold shower! The first pictures we had already taken down the hideous homemade lighting fixture. I will try to find a picture of it! Everything is going to be white, except the walls. They will be a sea blue! We are going for a Greek Island look! UGH! 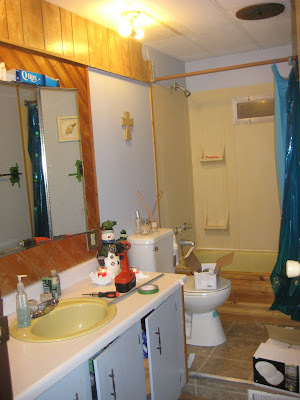 Blogger will not let me switch the pics around, so the between is first and the before is last! It was so neat to hear and see your renos! It's funny how it still kinda feels like ours even though its been so many years! And we so would have wanted those exact renovations so I'm really excited for you that you get to enjoy them! Show me all your after pictures!